This German healthcare building presents itself in the center of the New Berlin – the Science Center Medical Technology at Potsdamer Platz. 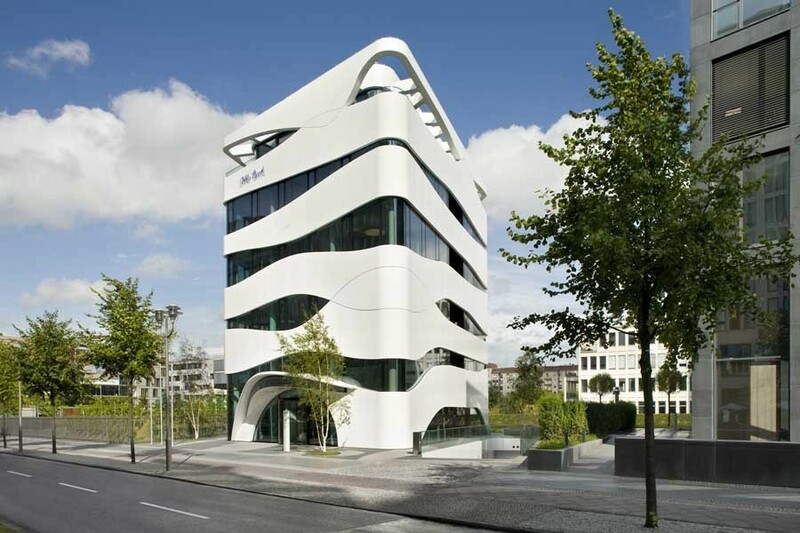 The new building is the representative office in the capital city for the medical technology company Otto Bock HealthCare GmbH, which is based in Duderstadt. In an interdisciplinary planning and design process, the building owners Otto Bock, the team of Gnädinger Architects and the media designers Art+Com developed this unique stage for the topic of movement, which is the first of it’s kind in the world. An exhibition invites visitors to “discover what moves us”. Admission is free. 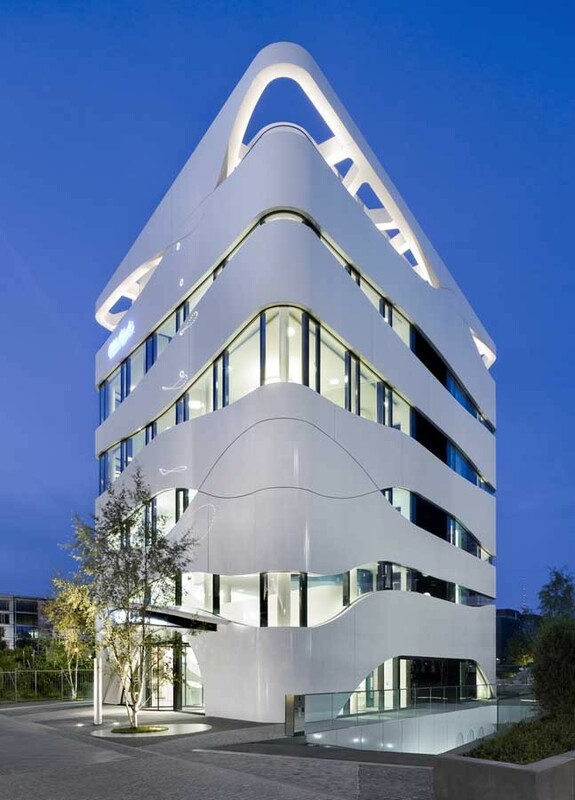 Starting from the idea of human muscle fibers, the Berlin architectural firm Gnädinger was assigned the task of creating an amorphous, abstract façade, which wraps dynamically around the six-storey, reinforced concrete frame, encompassing around 1,000 square meters of floor space. Behind the extravagant exterior with its convex and concave, tapered lines, three levels serve as exhibition space on over 500 square meters. The fourth level is for training and conference rooms and the top floor serves as a dialogue platform for interdisciplinary communication between doctors, patients, therapists, orthopedic technicians and manufacturers. 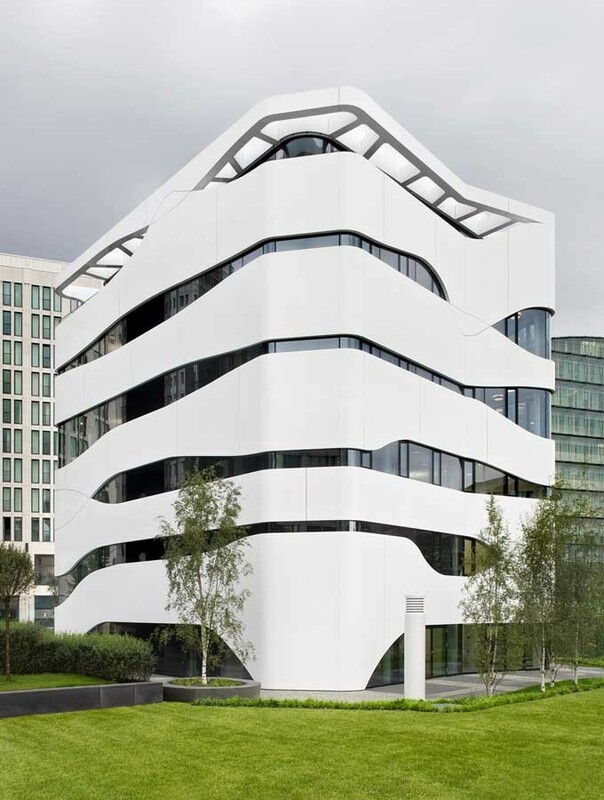 The outer shell, an expressive aluminum and glass façade, is unusual for the city of Berlin, and provides a kind of acupuncture of new architecture amongst Berlin’s traditional stone buildings and glassy modernism. In the immediate vicinity of buildings by architects ranging from Richard Rogers, Renzo Piano, Helmut Jahn, Hans Kollhoff to gmp, this compact structure demonstrates a confident independence. The architectural design was intended to bring high-tech and nature together in a harmonious manner. 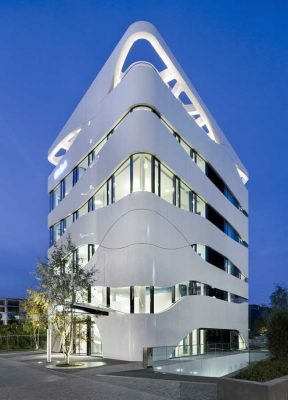 The organically-formed, white exterior buckled bands encircle the rounded body of the building, based on the model of human muscle fibers, a metaphor for the simulation of complex biological processes and structures. Running 12 meters high along the north and west façades is the so-called “Walker”, a motion simulation using 15 points of light that visually depict the theme of “walking” in the city space. The 15 points represent the great joints of the body, through the movement of which the physique, gender and mood of the walker can be recognized. The Science Center Medical Technology hosts an exhibition that was developed both for the general public as well as professionals, with the theme of technical and medical movement at its center. Playful demonstrations and interactive media stations illustrate the complexity of the human motor function and how sophisticated medical technology must be in order to act as a substitute for nature. The exhibits make it possible to experience “walking” and “grasping” with one’s own hands and feet, and sensitizes visitors to the importance of everyday movements and describes their scientific backgrounds. The Science Center bridges the gap between nature and technology, takes a look at bionic research and shows how natural functions can be transferred to technical aids. The medical technology company Otto Bock HealthCare, founded in Berlin in 1919 by Otto Bock, is a world leader in prosthetics and a leading supplier of innovative products for people with reduced mobility. Since 1990, Professor Hans Georg Näder, grandson of the founder, has continued to run this medium-sized family business to a global player. Today the company has 40 locations for distribution and service worldwide, and exports its leading technology to 140 countries.